Homeowners with elevated decks often find themselves in a conundrum when it comes to the space underneath the deck. While it may be a useable space, when it rains the water comes through the cracks in the deck above. This means that the space can’t really even be used for storage and it can’t be used be used to keep anything like furniture over the long term. Basically, the space under a deck often goes unused because there is no ideal way to use it. Fear not, there is a solution to this dilemma. To the rescue come under-deck ceilings! An under-deck ceiling is exactly what it sounds like. It’s a ceiling built up against and attached to the bottom side of a deck. The artificial ceiling is designed with the outdoors in mind, and with the idea of bringing the comforts of your home’s interior to the outside. The under-deck ceiling diverts water that falls from the deck above out to a special drainage system. Liquids that come into contact with this system are moved to a special drainage gutter on the outside and flow down a downspout. Essentially, it creates an outdoor, open air room that rain can’t disturb. The space under a deck become useable, and even livable with an under-deck ceiling! When you have one of these systems installed with a current or new deck, you can also elect to add on extras that make the space under a deck even more livable. A ceiling fan and some lighting make the outdoor space feel like a room in your own home. Adding speakers can make it great place to entertain where you don’t have to worry about rain showers dampening your gathering. You could even add mesh screening around the exterior of the new room and a door to make it bug-proof, comfortable and a great place for some extra storage when you’re not using it. Recently, we’ve been sorting through all the pictures that we take before we start a job and after it’s finished, and we noticed that some of them were in the wrong category! (gasp!) The person who placed them on our site had been a little confused about wether to classify a structure as a deck or a screened in porch when the pictures seemed to have both. This post is dedicated clearing up this confusion for one and all! Simply put a deck is an open-air area, sometimes with a pergola, that has no additional protection to keep mosquitos or snow out (short of a bug zapper or a kid with a shovel). A screened-in porch has a roof structure above it and screens that keep out the elements and bugs but still lets air pass through easily. Now, the confusion came from the screened-in porches also seeming to have a deck attached to the outside. 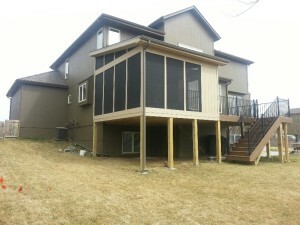 In fact though, many of the screened-in porches we build also include some kind of deck attached to the outside. Sometimes we include a few seats on the outdoor deck portion of the screened in porch for people to sit outside. Most homeowners use this outside deck for grilling as it results in less smoke in the screened in room but still lets the delicious barbecue smells through. 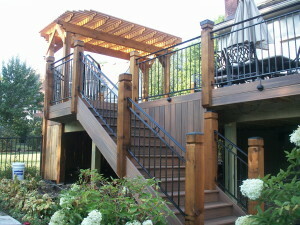 Decks and screened in porches are both quality additions that you can make to the back or side of your home. They can even be combined for additional work / cooking space and to add more square footage to a home. Every addition that we make to a home is completely custom, and sometimes that makes them hard to classify! What we can say is that an outdoor home addition in the form of either a deck or a screened-in porch will look great and help you create an outdoor space you’ll use for years to come! Deck accents are the little touches that make a big difference to those adding a new deck onto their homes or looking for ways to make their current deck more appealing to themselves, family and friends. Deck accents come in all shapes, colors and with varied functions, so let’s cover some of the more common accents you might add to make your deck pop. Seating is kind of (read, REALLY) important when it comes to the comfortability of your deck. This can be an accent, but it is really an essential piece of most back yard paradises. Seating can come in the form of deck chairs and a table purchased from just about any grocery store or hardware store (at the right time of year), all the way to novel built-in seating. Especially lately, home-owners who have chosen to build low-to-the-ground decks have also had special in-deck seating areas installed. These double in purpose as both a low guard rail and a place to relax! Installations like these also tend to complement patio furniture quite well, serving a great place for plants to live and grow. Having a patio with a deck is a really nice touch. For many families, this is a great option because the kids need a place to play and the patio can fill that role! The simple concrete slab patio works great as a basketball court or as a dry-off spot after playing in the sprinkler. For those looking to really make a statement with a patio, natural stone might be the best option. Natural stone looks beautiful year-round and lasts for a very long time. The price point may be somewhat higher than for concrete, but you’ll want to walk on these types of installation barefoot! This is probably our favorite accent. Lighting sets the mood and gets people feeling comfortable. Classy accent lighting can be just the thing to make a deck really relaxing, for both owners and guests. We recommend permanent accent lighting installations with automatic sensors for on/off times, plus additional string lighting for when you’re having company or hosting any kind of gathering. The Fourth of July is, understandably, a lot of people’s favorite holiday. What’s not to like in the middle of summer about barbecue, fireworks, pool parties and an extra day off? Not much! That’s why we’re encouraging everyone to have a great time and be safe this Fourth of July. For homeowners, remember that fire doesn’t really mix well with decks or houses for that matter. Fireworks really are explosives, and one thing that anyone who plans to celebrate with fireworks (or has neighbors who are) should have on hand is a garden hose and a bucket of water. We’re not saying that the four year old next door with the sparkler is irresponsible . . . okay, that’s exactly what we’re saying. The trick to you and your property surviving fourth of July is to always be prepared. Keep in mind that things like unattended grills and candles can start fires too. Don’t leave the grill running all night! Turn it off or put it out when you’re done – that way you can focus on being safe with explosives instead of having to split your attention between two different hazards! It also never hurts to have a bag of sand around for stubborn fires (like lit sparklers). What we do recommend is sitting outside with friends and family, enjoying what is hopefully gorgeous weather and one of our favorite seasons. Most of all, have a happy, safe, fun and awesome fourth of July! It’s finally summer, and you’re finally ready to have the deck built onto your home. You’ve got an idea of what you want, and you’re starting to envision your family and you enjoying the sunshine and warm evenings outdoors. If you’re ready to start the process, there are thee things you should know before calling your Liberty deck builder. Many cities require even private residential buildings to get a permit before making major structural changes to it. In Liberty, some decks must get a permit before construction is allowed to begin. Any deck that will measure 30 inches above grade (basically, the ground) is required to be permitted. Alexander Decks takes care of this step for its clients, as this requires the filing on the plot plan and the building plans for the structure being added. The reason permitting is required in Liberty is to maintain the safety of all structures. It stops contractors from building inferior or dangerous structures, and preserves the safety of homeowners and their property. For example, a raised deck must be safe to walk on because the home needs necessary escape routes should a fire break out inside. Working with a local contractor helps spur economic growth in Liberty and means that you’re working with someone who likely lives in the same community. Aside from the economic benefit to everyone, this also helps you keep your contractor accountable for the work they performed. Contractors want to do their best work for their neighbors because they know that building high-quality, lasting decks and homes is how they build a great customer base. Plus, they know the local regulations for deck building better than someone from outside the area. Should any problems actually arise, they’re right near by to asses the situation and help you resolve it. Most contractors can work with your needs as well, whatever they may be, so there should be no need to look too far from your community or metro to find the right people for you. In Liberty there are a couple of additional requirements that may limit the size or location of a deck. Decks must be set back at least 7 feet from the side yard of a home, and have at least 24 feet of rear yard setback. The ground underneath the deck must be appropriate for building as well. Any pier driven into the ground in decks over 30 in. must penetrate at least 3 feet down and bear weight in undisturbed soil. Wood rot is the enemy of an old deck. If you’ve had your home for more than 10 years, your wood deck probably isn’t in the shape it once was. Nowadays, many decks are being constructed using materials like PVC and other composites that don’t suffer as much damage through the passage of time when compared to wood decks. Wood, while it can be beautiful, has to be rigorously maintained in order to prevent wood rot. Wood rot happens to most wood decks at some point, especially those that aren’t vigorously maintained. Wood rot is a natural process that progresses thanks to fungus, bacteria, heat and water exposure. Water exposure from sprinklers and splashing rain drops have the most impact on how quickly a wood deck breaks down. For some homeowners, skipping a year of deck staining or using the least expensive protectants seems to be the best option, but the long-run costs can be much greater and potentially dangerous. When wood rot strikes your deck, the fibers start to break down and soften. It’s pretty easy to tell if you have wood rot using some basic tools. Grab a screwdriver or a nail punch and get down underneath your deck. Take a flashlight to make sure you can see, and push the poker into the beams and joints (especially at the ends of the boards). If you can’t get under the deck, you may just need to remove a few of the top boards and test the wood beneath. If you do find that the support beams are showing signs of rot, with darkened color and softer skin, the deck may not be entirely safe to use. In these cases, it’s always a good idea to consult with a professional who can tell you the extent of the damage, how to repair it and help you identify the urgency of the problem. Often, rot that shows itself only on the top boards can be easily repaired with replacement boards, and you can either do this yourself (don’t forget to seal and protect it) or you can hire a pro to take care of it for you. Another very important element to check is the ledger, or the boards on the exterior of your home where the deck connects to the house itself. If the ledger wasn’t properly protected after an original deck installation or rebuild, wood rot could be happening here. This is extremely dangerous as it can allow the deck to collapse, and it can affect all types of decks, including PVC and composite. When you’re not chilling on your new deck from Alexander Decks, we encourage everyone to still get outside and experience what the community has to offer. There are all kinds of community events that go on throughout the spring and summer months, many of them are even free. Kansas City has a lot of vibrant communities that love having events, and they’re all worth attending. Popcorn in the Park, May 29 @ 10 PM, Liberty – The Liberty Parks and Rec department puts on a free show that’s perfect for families of all sizes. Big Hero 6 will be playing and everyone is invites to enjoy the show with free popcorn, or to bring snacks of their own choosing. The kids will love it, and Big Hero 6 is a movie even the adults will enjoy. Vaile Mansion 2015 Strawberry Festival, June 6 @ 9:00 AM – 4:00 PM, Independence MO – Brining in more than 600 pounds of strawberries and cooking them in every kind of sweet treat imaginable is the perfect way to enjoy a perfect late-spring day. With tons of food, antique vendors, music and even ballet, there’s something everyone can enjoy. Theater the in Park, Starts in June at Shawnee Mission Park, Most Evenings @ 8:30 PM – If you’re a Johnson County native, you’ve probably heard of the Park and Recreation District’s Theater in the Park. Every year from June through about the beginning of August performers put on a range of shows from West Side Story all the way to Shrek. Adult tickets are $8, youth tickets are $6 and young children get in free. This year the park will also be hosting Movies in the Park on a regular basis. Find more info at theatreinthepark.org. Every First Friday throughout Kansas City – A tradition that started in Kansas City’s crossroads arts district is now a staple of makes the city special. First Fridays feature art, music and other cultural events, most of which have no or reduced costs in celebration of First Friday. While the Crossroads is a still a bustling hub of activity, you will now find similar events through the Kansas City community on the First Friday of every month. The American Royal – From September through November, the American Royal holds events and invites tourists and locals alike to join in all kinds of fun. If you’re a seasoned backyard barbecue veteran, you’ll love the October 1-4 world series of barbecue competition featuring the best cue’ anywhere in the world. All of the events are great fun for adults and kids alike. Summer is nearly upon us, and the 80 degrees days are getting us excited for being outside as much as possible. In the spirit of summer, if not quite the actual season yet, we present the top four games you, your kids and neighbors can build and play together. These might actually be the best reasons to hold onto the leftover wood from when your deck was built or renovated (recycling can be a lot of fun)! 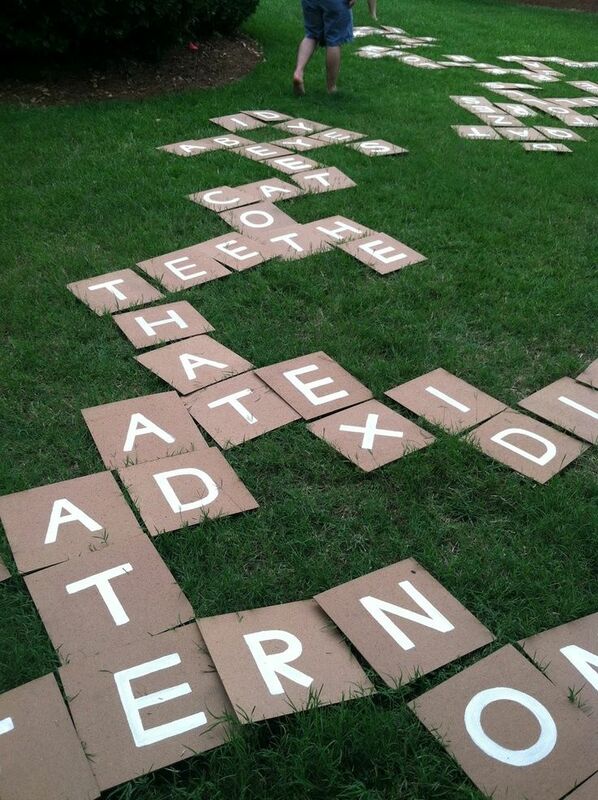 Enough with the wimpy Scrabble game you’re used to, super size it and make it more fun for everyone. You can keep this project simple or get complicated with it. All you really need to make it happen is some flat, heavy material that will work with paint – wood, tile, heavy cardboard, pretty much anything will work! Cut the pieces to be roughly the same size, making sure they’re oversized for fun and readability. Print out large letters on your printer and use an exacto knife or other razor to cut them out, then use the paper as a paint stencil. Grab your pain roller and get to work, you’ll need this many of each letter – E x 10; A x 8; R x 7; I x 7; O x 7; T x 7; N x 7; S x 5; L x 5; C x 5; D x 4; U x 4; P x 3; M x 3; H x 3; G x 2; B x 2; F x 2; Y x 2; J x 1; W x 1; K x 1; V x 1; X x 1; Z x 1; Q x 1. That’s the basic setup, but you can also turn these into connecting tiles, build letter holders and even game boards if you’re feeling particularly ambitious! Remember this game? Now you can build it yourself. It’s kind of ridiculous, but it will definitely make for a lot of good times. As opposed to the backyard word game, this one will probably require a trip to the hardware store if you don’t have extra wood around or the right tools for the job. Check out how to build it over at This Old House. This one’s super easy. 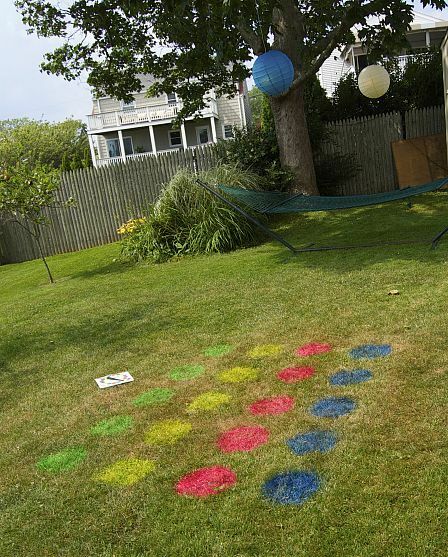 If you’ve got some spray paint and a yard, you can build your own game of Twister that doesn’t require the silly plastic mats. Spray paint a 5 by 4 column with one color in each column, spacing each circle about a foot apart. While you let it dry create your own spinner using a piece of cardboard or foam core material, a piece of plastic and a tack. 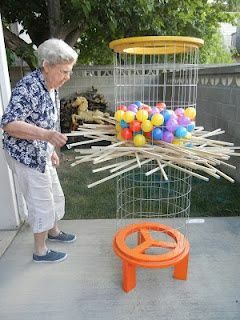 Simple, fun and the whole thing will take 10 or 15 minutes to put together. This one may at best help you use one piece of leftover wood for the spinner, but it’s neat purely for its simplicity! Grilling is the a traditional activity of American men and women during summer, often this tradition is held on that most sacred of outdoor spaces, the back deck. In this special place, thousands of pounds of delicious meats, seafoods and vegetables are smoked and cooked to charred perfection. But for those without the proper equipment, watching the neighbors feast on pork chops, hamburgers and steaks while the grillless person nibbles on mere pasta salad. If you’re ready to join the ranks of the backyard grillers, then we have something that will make grilling fun and delicious while making the neighbors jealous. We don’t often recommend brands, but if you’ve never tried the meat made in a Traeger grill, then you don’t know what truly delicious grilled meat is. The combination smoker and grill makes smoked meats that are as moist as unsmoked grilled meats, but with all the flavor of their smoked counterparts. The Traeger grill uses wood pellets that are specially designed to be fed into the smoker using an automatic electric auger. The pellets burn into great smelling smoke that will permeate the whole neighborhood, and whatever dish you happen to be grilling too. It’s guaranteed to encourage your neighbors to invite themselves over during the summer. The smoker and grill comes in two different sizes, meaning that you can pick the one that’s perfect for your family and deck. The larger size is big enough to cook two large turkeys at the same time (seriously). Trust us, you won’t be missing out by getting the smaller size. Both make delicious grilled and smoked meats. Maybe it’s not the top reason for adding a deck onto your home, but lording over all that you see from your elevated grillmaster’s pedestal can be quite an exhilarating experience. If you want to do it, and you want to do it right, go with the Traeger for your backyard grilling and smoking adventures. In the spirit of getting you ready for the spring and fall, and because we’re Overland Park’s coolest deck builders (you know it! ), we’re sharing the love as to how to get your deck ready for spring and summer with some pro tips! These really aren’t for shade or privacy, they’re for looking good and making your outdoor space really feel like home. For decks that have a screened in porch or a pergola, installing curtains is pretty straightforward. We recommend getting curtains in complementary colors to add some flair – grab a set of swatches from a local hardware store and see how the colors work with your space. You can also always go with a safe, neutral color too if that’s more to your liking. To install follows pretty standard installation procedures, just make sure to consider wether you want to leave the curtains up all year or just during the warm months. If you plan to leave them up all year, just make sure that you get the kind that are ready to stand up to the elements! Check these out over at JCPenny to get an idea of the kind you might want to install. Got a deck that doesn’t have built in lighting? Add your own with some simple string lighting! String lighting rocks when it comes to creating ambiance for everything from a relaxing evening at home to a Fourth of July barbecue. You can run the lights overhead from your house to a pergola or deck rail. If that’s not feasible, even running them from a nearby fence can work well, and can be used in this way to even complement installed deck lighting. Your setup will vary based on your deck’s location relative to your house and yard features, but the principles are the same. We’ve always said that lighting is an important factor in making a deck really pop, so we highly recommend getting string lighting especially if you don’t have any other! We’ve definitely mentioned this before, but we’ll say it again – getting plants onto your deck makes it feel alive. If you’re not including planters and living things in your deck setup, you’re missing out on something that makes it really special. You can get plants on your deck in a number of ways too. One of our favorites is the hanging planter box with flowers that continually bloom. But if that’s not your style, hit up your local garden center and ask about plants that do well in planters in the summer heat. They will probably even have planters already containing the plants, meaning that all you’ll have to do is take it home, set it outside and maybe water it occasionally. It’s easy and it brings your deck to life! We’ll contact you for the info we need! 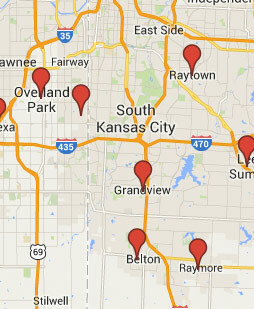 Serving KC and Johnson County Areas.